This iMac looks very much like the previous generation - so much so that we almost considered not doing a photoshoot with it and just reusing the photos from our review of the previous model (though obviously we didn't do that as that's not the kind of truthfulness you expect from Digital Arts). What's behind the screen is all brand new though - and Apple is claiming that it's up to twice as fast as before. This is the first Mac to offer 9th-generation Intel Core processors: with a choice of six-core i5 or i7, or 8-core i9 chips. The previous iMac offered only four-core i5 or i7 7th-generation chips. This puts the iMac a generation ahead of the MacBook Pro and Mac mini, which both have 8th-generation chips. The same is true for the iMac Pro, though this has a Xeon processor that gives you the option of eight to 18 cores - though the other advantage or Xeon chips over Core, that you can put more than one in a workstation, doesn't apply to the slimline Mac Pro. Unlike the iMac Pro, the new iMac doesn't use full-spec desktop processors, but a lower wattage version that's still a grade above laptop chips. Our review unit of the 2019 iMac has the flagship i9-9900K chip, running at 3.6GHz. When all cores aren't needed, the chip automatically boosts the speed of those that are using Intel's Turbo Boost tech, dialling it up as far as 5GHz. The naming of the chip is a little odd, as Intel usually gives a different final-letter marking to lower-powered versions of chips - so the Mac mini's Core i7-8700B has a B at the end that tells you it's not as powerful as a top-of-the-line desktop PC's i7-8700K. 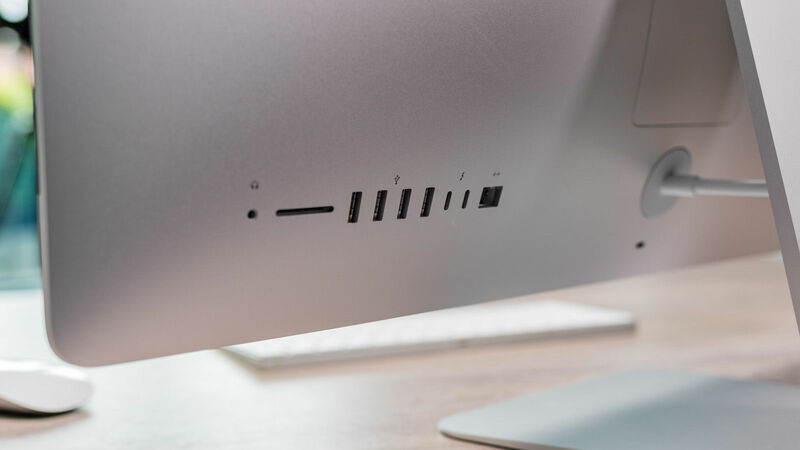 But the chip in the iMac is as powerful a Core processor as you're going to get into an all-in-one desktop - and if it's the maximum i9 power you're looking for, you'll need to look to boxy workstations such as a Scan 3XS WI4000 Viz. So far, (so) so many numbers. Well, here's some more as we try to establish whether the new iMac lives up to Apple's claims - and how it measures up to rival systems. Finding a direct rival is difficult as both Dell and HP's all-in-ones - the Inspiron 27 and Envy All-in-One - haven't been updated to 9th-gen chips yet. This is also the case for Microsoft's 'iMac you can draw on' Surface Studio - and we haven't seen Lenovo's seemingly-Dieter-Rams-inspired oddity the A940 in the UK yet. So instead we've compared the iMac to what you might consider buying instead of an iMac. Instead you might you want the highest performance in multi-threaded creative apps as a Mac (Apple's iMac Pro) or a PC (an HP Z8 dual-processor workstation), albeit with a much higher price tag. You might already have a high-spec screen and consider the relatively tiny Mac mini. Or you might want portability and performance - again as a Mac (MacBook Pro) or our best laptop for design and art (Dell's XPS 15, which offers better value than the MBP, if not better performance). First off, we used the new Cinebench R20 benchmark. Based on the latest version of 3D animation suite Cinema 4D, this renders a scene using the processor alone - so it's a great indicator of how fast a chip it is. It's a lot more accurate for chip performance in 2019 than the older R15 benchmark that we used to use, as that didn't support modern chip technologies that can really affect how fast they run. Here the new iMac is 52% faster than the top spec Mac mini, and 76% faster than the best MacBook Pro. However, the 10-core iMac Pro is still 25% faster than the eight-core iMac, so there are clearly still advantages to the Pro. And with two 10-core processors, the HP Z8 G4 was a whisper away from being twice as fast as the iMac - but at a much, much higher price. 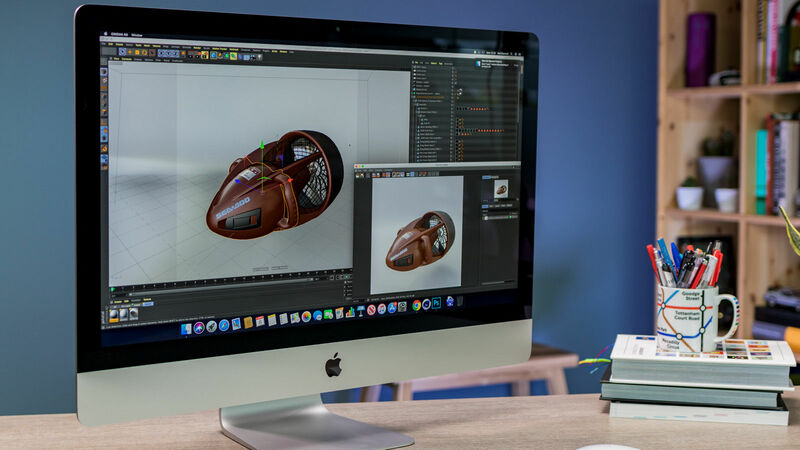 The iMac has an Intel Core i9 3.6GHz 8-core CPU, 16GB RAM, a 512GB SSD, AMD Radeon Pro Vega 48 graphics with 8GB of HBM2 memory and costs £3,284/US$3,449. The iMac Pro has an Intel Xeon 3GHz 10-core CPU, 128GB RAM, a 2TB SSD, AMD Radeon Pro Vega 64 graphics with 16GB HBM memory and costs £9,188/$9,748. The MacBook Pro has a Core i9 2.9GHz 6-core CPU, 32GB RAM, a 2TB SSD, AMD Radeon Pro 560X graphics with 4GB RAM and costs £4,409/$4,699. The Mac mini has a Core i7 3.2GHz, 6-core CPU, 32GB RAM, a 1TB SSD, Intel UHD Graphics 630 graphics and costs £2,419/$2,599. The Dell XPS 15 has a Core i9 2.9GHz 6-core CPU, 32GB RAM, a 1TB SSD, Nvidia GeForce GTX1050Ti 4GB graphics and costs £2,349/$2,909.99. The HP Z8 G4 workstation has two Intel Xeon Gold 6144 3.5GHz 8-core CPUs, 96GB RAM, a 512GB SSD + 1TB 7,200rpm hard drive and a AMD Radeon Pro WX9100 graphics card with 16GB RAM. POA. There are also new, much more powerful graphics chip options. The new AMD Radeon Pro Vega 48 graphics chip with 8GB of HBM2 memory offers 50% better performance than the previous flagship model’s chip, says Apple. The company also offers a Radeon Pro 580X with 8GB RAM for those who don’t need such extreme graphics performance, or a Radeon Pro 570X with 4GB RAM on the lower-end configurations. We tested this using our own Cinema 4D test - as Cinebench no longer has a graphics performance test. Our benchmark renders a scene using the GPU-based ProRender rendering engine, so the results are indicative of real-time 3D performance - plus any other task that uses the graphics card from certain Photoshop filters to both real-time effects processing and the speed of encoding video in Premiere or Final Cut Pro. Here the iMac was the best performer, only topped by the outrageously expensive Z8 G4 workstation and its AMD Radeon Pro WX9100 full-size graphics card with 16GB of its own RAM. Our Photoshop benchmark is a good guide to a computer's overall performance for design and art, if not high-end animation and VFX. Here the iMac was the fastest performer overall - beating even the Z8 G4 workstation. The outer shell of the iMac remains the same. The design is still elegant, and there are enough ports hidden away along the back to connect your current add-ons - though oddly there's only gigabit Ethernet, while the Mac mini has a 10Gb ethernet option. The 5k, 5,120 x 2,880 is still higher-resolution and better quality than most screens used by many designers - even despite Apple plumping for matching digital cinema's DCI-P9 colour space, meaning it can only output about 92% of the Adobe RGB colour space. 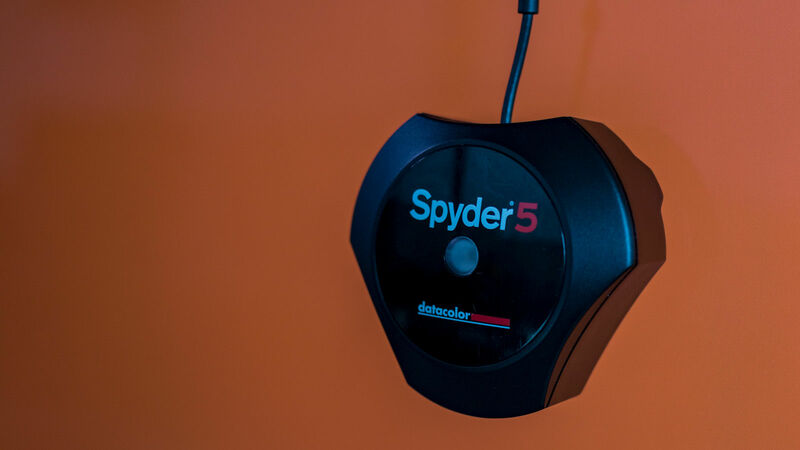 It is incredibly accurate though, as we found by testing - as we always do - with a DataColor Spyder5Elite. 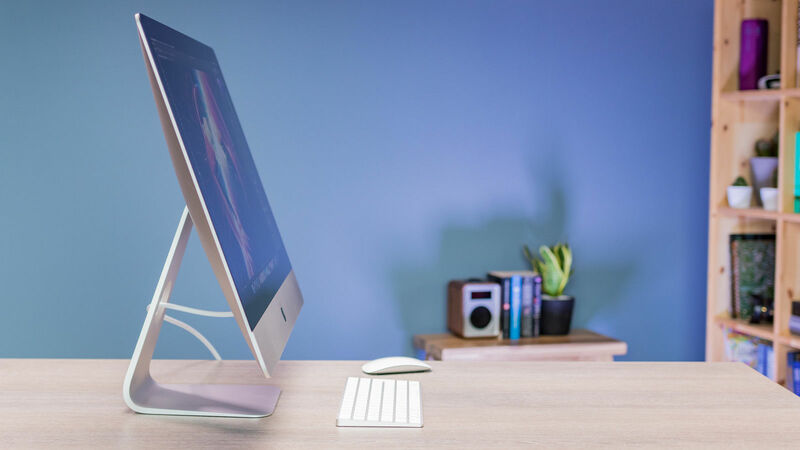 So the iMac is still the ideal all-in-one. But where I have an issue with the iMac - and all-in-ones really - is that if you already have one and you upgrade, then you're buying a new computer and another screen you already have. In 2019, it just seems so wasteful. And sadly, if you want a Mac desktop with high graphics performance, the iMac is your only option - I'm not counting the iMac Pro as a separate Mac here, it's a souped up iMac and the same applies. This will remain true until the much delayed Mac Pro appears - and we still don't know when that is. So you'll want the iMac for its performance and you'll likely buy it, but don't be surprised if you don't feel a little guilty about that.